Turkey’s agenda is changing at an incredible speed. This change makes itself felt in every area of society. Social, legal and political changes happen in many fields; from economy to culture and internal politics, from environmental issues to external politics. The media in particular plays a significant role in helping to understand the society of Turkey and to grasp the reflections of this change on various political and social areas. Therefore is a gap of profound analysis and information supporting readers inside and outside of Turkey in drawing their own conclusions. Understanding the transformation of Turkey requires more diverse analyses of a higher quality for the reader inside and outside of Turkey. Aiming to fill this gap, the Turkey Representation of the Heinrich Böll Stiftung (hbs) has decided to publish the quarterly, “Perspectives – Political Analysis and Commentary from Turkey”, in both Turkish and English. This quarterly periodical strives to be a source of reference for civil society, decision makers, opinion leaders in- and outside of Turkey. Each magazine will present feature articles, articles on ecology, democratization, culture, international politics and news from hbs. Each issue also contains a short biography in an attempt to present the impact of the developments in Turkey from a human perspective. We very much hope that Perspectives does not only provide political analysis and commentary on Turkey but also contributes to a fruitful and lively debate on issues of importance for a peaceful, democratic and sustainable future of Turkey. With round table discussions that we will organize on the topic of the feature articles, we would also like to discuss intensively with you. The thirteenth issue of Perspectives, "Analysis and Commentary from Turkey", is out now. In this issue, we are featuring a special dossier on "Global Governance and Development". The articles critically approach the understanding of development and related policies in both Turkey and at the global level, discuss the current situation of Turkish development policies in industry and agriculture, and call attention to alternatives to the existing development discourse. Under our usual titles, you will find important discussions about the democracy, foreign policy, ecology and cultural agenda of Turkey; for example, some cover current political issues, such as the presidential elections in Northern Cyprus, the June 7th General Elections, and the Camp Armen resistance, of which the consequences are still to be observed. In this issue, you will also find an interesting interview with the authors of a recent publication on the Armenian Genocide, "One Hundred Years of Sorrow, 1915- On the Track of Social Memory in Diyarbakır". 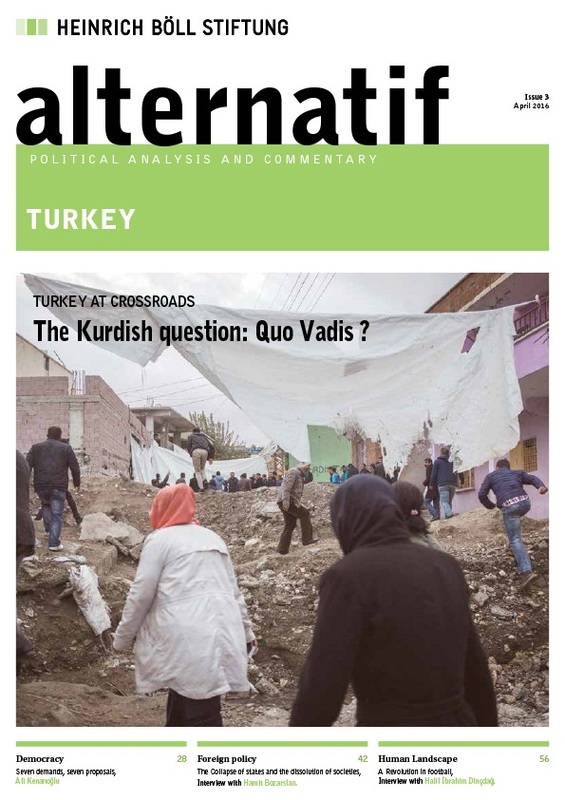 The 12th issue of Perspectives "Analysis and Commentary from Turkey" is out now. The dossier "Global Governance and Gender" features articles which cover the "blindness" among international institutions as well as the international society in a wide range from economy to politics and law. As usual, Perpectives includes different articles which throw a glance at the current agenda of Turkey from within the angle of democracy, foreign policy, ecology, environment and culture: recent discriminatory developments in the education system, discussions about nuclear plants, the meaning of the presence of IS and the latest domestic security bill are only some of the issues dealt with. We hope that you will enjoy reading every single piece and appreciate any feedbacks and comments. 11th issue of Perspectives "Turish Economy on the Eve of General Elections" is out now. We feature a special dossier on the status of economy in Turkey, titled: The Economy is Swell, the Citizen is Unwell". You can find 2 comprehensive feature articles. As usual, we cover foreign policy, ecology and culture topics with very interesting articles. We hope you enjoy reading Perspectives and expect your feedback. 10th issue of Perspectives "Analysis and Commentary from Turkey" is out now. We feature a special dossier on the status of children in Turkey, titled: The Children of The "New Turkey". You can find 5 comprehensive feature articles on the experiences and problems of children in contemporary Turkey. As usual, we cover foreign policy, ecology and culture topics with very interesting articles. 9th issue of Perspectives "Analysis and Commentary from Turkey" is out now. We feature two special dossiers in this issue: the democracy dossier analyzes the current situation and strategies of significant political actors towards the Presidential elections. We also prepared a gender and macroeconomy dossier, which hopefully would provide an introduction to a gendered reading of macroeconomic issues in Turkey, who will be hosting the G20 summit in 2015. As usual we cover foreign policy, ecology and culture topics with very interesting articles. This issue opens with an article by Yunus Sözen that evaluates the local elections which were held on 30 March. Our special dossier is on capital and capitalists in Turkey. We analyze the varieties of business groups from Gülen community to capitalists of the Kurdish region. Democracy section features an article on recent internet censorship efforts by the government. As usual we have other interesting articles in our Ecology, International Politics, Culture and Human Landscape sections. We hope you enjoy the read. We greet 2014 with a new lay out and, as usual, feature articles that examine the background of the current political atmosphere in Turkey. As Turkey enters into a period of elections, Perspectives analyzes the strategies of main political actors and emphasizes the role of urban politics for the municipal elections in March 2014. In our dossier, we cover a range of articles from the autonomy of local governments to “crazy” construction projects planned by the central government. The Democracy section is particularly rich in this issue and supported by two extensive articles on the foreign policy of Turkey and cultural politics of the Gezi Protests. Muharrem Erbey, a human rights activist under arrest as a part of KCK trials, is our guest in the human landscapes section. We hope you enjoy reading our 7th issue, which we hope serves as a compass in these tumultuous times for politics in Turkey. Of course, we appreciate any feedback and comments. The 6th issue of Perspectives - Political Analysis and Commentary from Turkey is out now with feature articles on "Grapes of Wrath: The Transformation of Agriculture and Rural Areas in Turkey". We prepared this issue for highlighting ongoing reforms in the field of rural development and agriculture in Turkey. Gökhan Günaydın, Abdullah Aysu and Sibel Caşkurlu are some of the authors who contribute in our feature articles section. The 6th issue of the Journal also covers articles on current political issues, foreign affairs, economy, environment and art. We followed-up on our last issue on Gezi Protests with three articles and an interview. We hope you enjoy the read and welcome any feedbacks. The protests sprang from Gezi Park, and spread throughout Turkey in a short period of time, mark a historical turning point for Turkish democracy. Accounts and analyses of Gezi Protests are limited for foreign readers. Therefore, for this extraordinary occasion, we introduce a special cover story on Gezi Park Protests in our 5th issue. Perspectives - Political Analysis and Commentary from Turkey - evaluates the protests through three articles from Deniz Özgür (Gezi Park activist), Cengiz Çandar (political analyst) and Ska Keller (Member of the European Parliament). The 4th issue of Perspectives, the Journal of Political Commentary and Analysis from Turkey, is just published! It contains feature articles on the "Green Movement in Turkey". Besides that you will also find articles on the fields of democracy, culture, ecology and foreign policy. In this issue we included an interview in our Human Landscape section. We hope you enjoy reading the new issue of Perspectives! 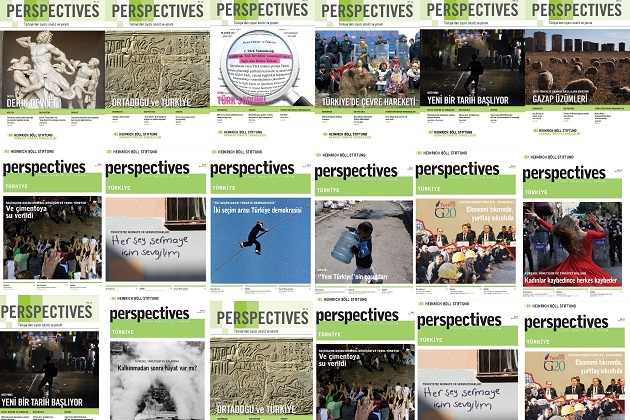 We’re happy to announce that the third issue of our quarterly magazine Perspectives – Political analysis and commentary from Turkey just appeared today with a rich collection of articles on hot political issues,democracy as well as the political system, the environment, ecology, the arts and many other subjects. The highlight in this second issue will be on “ The Turkish Question ” with perspectives by Doğu Ergil, Ahmet İnsel, Evren Balta Paker, Mustafa Sönmez, and İnci Özkan Kerestecioğlu. We’re happy to announce that the second issue of our quarterly magazine Perspectives – Political analysis and commentary from Turkey just appeared today with a rich collection of articles on hot political issues, foreign policy and economy as well as the political system, the environment, ecology, the arts and many other subjects. The highlight in this second issue will be on the “ Middle East andTurkey ” with perspectives by Soli Özel, Bayram Balcı, Sedat Aybar, Şah İsmail Bedirhanoğlu, and Sezgin Tanrıkulu not to mention a first-hand account of what’s happening in Hatay by Nidal Özdemir, a local resident. The authors draw a critical analysis on the so-called new foreign policy of Foreign Minister Davutoglu. They clearly show, why this policy was meant to fail from the beginning. Turkey’s policy towards Syria and its perception in Syria will be debated based on a up to date view from within. The feature articles of this first issue deal with the historical background and recent developments concerning the “deep state” of Turkey. We regard the “deep state” as one of the important impediments in the democratization of this country. With the different reforms that led to a change in the civil-military relationship, with the law suits such as the Ergenekon trial, and with the trial against responsible personality of the coup d’état in 1980, it became a much discussed topic; if the AKP government attempts to destroy the deep state; if it is accommodating to it or just changing the actors of the “deep state”. In our first issue, we try to give answer to these questions. In addition to the feature articles, topical articles on issues such as the reform of the educational system, censorship in the arts as well as the renewable energy law and the reform of the health system are addressed. Along with this issue, we also have a polite request for our readers: We would like to ask that you share your critiques and suggestions about Perspectives, through which, since our first publication in June 2012, we not only strive to for providing political analysis and commentary from Turkey, but also create a vivid discussion platform for the creation of a peaceful, democratic, and sustainable future for Turkey. You can access the questionnaire through this link: https://tr.surveymonkey.com/s/W5MF6PK until September, 1. We thank you very much for your contribution and hope that you enjoy reading Perspectives.